We’d love your help. Let us know what’s wrong with this preview of The Suffering of Women Who Didn't Fit by David J. Vaughan. For over 500 years, women have suffered claims of mental decay solely on account of their gender. Frigid, insane, not quite there, a witch in sheep's clothing, labels that have cast her as the fragile species and destroyer of Man. This book reveals attitudes, ideas and responses on what was to be done with 'mad women' in Britain. Journey back into the unenlightened Middle Ag For over 500 years, women have suffered claims of mental decay solely on account of their gender. Frigid, insane, not quite there, a witch in sheep's clothing, labels that have cast her as the fragile species and destroyer of Man. Journey back into the unenlightened Middle Ages to find demonic possession, turbulent humours and the wandering womb. In the Puritan Age, when the mad were called witches and scolds ducked for their nagging. The age of Austen and a sense and sensibility created from her fragile nerves. Then descend into Victorian horrors of wrongful confinement and merciless surgeons, before arriving, just half a century past, to the Viennese couch and an obligation to talk. At the heart of her suffering lay her gynaecological make-up, driving her mad every month and at every stage of her life. Terms such as menstrual madness, puerperal insanity and 'Old Maid's Insanity' poison history's pages. An inescapable truth is now shared: that so much, if not all, was a male creation. Though not every medic was male, nor every male a fiend, misogynist thought shaped our understanding of women, set down expectations and 'corrected' the flawed. To ask other readers questions about The Suffering of Women Who Didn't Fit, please sign up. This book is packed full of the history of madness and how women were affected by it. The author exposes the numerous theories, put forward by men, to explain the behaviors of women that weren't considered acceptable, and the treatment or mis-treatme A rare synchronised study of the colourful, often horrific, account of women and madness over half a millennia. From scold to witch, virgin to whore, this book exposes how an unchanging perception of women has altered responses to gender and madness. This book is packed full of the history of madness and how women were affected by it. The author exposes the numerous theories, put forward by men, to explain the behaviors of women that weren't considered acceptable, and the treatment or mis-treatment that ensued from those theories. It is not uncommon to see a diagnosis of madness used as a means of controlling women in society. This book is extensively researched and documented. While the information here is fascinating it's not written for the casual reader. This book is more suitable for a college text. That being said, it is well written, informative and an excellent study of the topic. 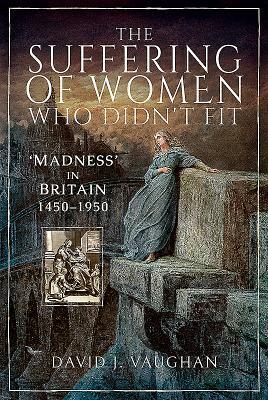 The Suffering of Women Who Didn't Fit: 'Madness' in Britain, 1450-1950 by David J. Vaughan is a free advanced reader copy of a hardcover book offered to me by Pen & Sword in exchange for an honest review. Vaughan just loooooves his sentence breaks, in my opinion, as I had noticed, the more I read. With that in mind, it creates a jutting, jittery pace as one reads and it’s amplified while wandering through time within topics (like a tour guide absentmindedly flinging their arm out to gesture a The Suffering of Women Who Didn't Fit: 'Madness' in Britain, 1450-1950 by David J. Vaughan is a free advanced reader copy of a hardcover book offered to me by Pen & Sword in exchange for an honest review. I received this book from the publisher in return from an honest review. I'm interested in the history of mental illness in Britain, and thought this book would be an interesting addition to my library. I was a bit disappointed in the writing; a lot was said but not much of it was new. The thrust of the narrative is that women were treat badly in mental health care because of the ill-informed ideas of men. Published author (Pen & Sword, The History Press, etc), historian, blogger, book reviewer, media presenter and public speaker, David J Vaughan writes both fact and fiction including on history (often bloody), crime and insanity (spanning 500 years). A 'jobbing' feature writer across mainstream independent publications. His latest book, The Suffering of Women Who Didn't Fit. 'Madness' in Britain, 1450-1950 was published by Pen & Sword History in November 2018. •	The Secret Life of Celestina Sommer. A Very Victorian Murder (Amazon eBook, 2014). All are available from leading High Street and Online retailers and direct from the publishers. David also owns and writes his blog about Crime and Insanity in Victorian England, at criminalunacy.blogspot.co.uk, receiving in excess of 2000 hits every month. He gives talks and lectures on various related topics of interest: such as crime, madness, local history and the archaeology of Britain. He also reviews titles for Routledge and other, similar publishers of related journals and books.